Harry Prisk’s brisk hat-trick was the highlight of an amazing second-half goal glut at Nyetimber Lane. With no goals at half-time, the naysayers were forecasting another home draw for Pagham. How wrong they were. Loxwood’s card was marked as early as the first minute, a Scott Murfin free-kick frantically scrambled away. Three minutes later another chance came the Lions way, debutant Liam Brady latching on to a Howard Neighbour pass. Pinging the ball into Charlie Williamson, only some last-ditch defending kept the Lions from opening the scoring. With Ryan Davidson restored to the side to partner Daryl Wollers, the Lions back-line was looking solid. Pagham did have the ball in the net on six minutes, Neighbour steering home a Murfin free-kick. Up went the flag and the scoresheet remained unblemished. James Binfield was called into action early on as Mark Goldson was looking useful for the visitors. In a fair wind and stinging cold rain, it was the home side making the best of the conditions. On 20 minutes, Alfie Davidson appeared to be bought down. The referee played the advantage as the Lions forced a corner. Justice was almost done for Davidson as he bought down the corner, only for his shot to go narrowly over the bar. A scare for the visitors came with ten to go in the first half. Down went keeper Liam Matthews. Only after extensive treatment was the Loxwood stopper able to carry on, albeit a tad gingerly. This seemed to prompt Loxwood into a more positive period of play, shots from Lewis Westlake and Ash Mutongerina missing the mark. The first yellow of the game went to Loxwood’s Olu Lapite, while his team-mate Ross Swaine followed him into the book a minute later. Two minutes after the restart a curling strike from Neighbour forced Matthews into a fingertip save, conceding a corner. A tremendous tackle from Wollers denied Goldson as he raced goalward. Another booking followed for Loxwood, Westlake seeing yellow for a foul on Hendrick. A pivotal substitution for Pagham came ten minutes in. Off went Alfie Davidson, with Prisk replacing him. Prisk had been on the pitch less than ten minutes before he got the opener for the Lions. A pinpoint pass from skipper Jamie Horncastle was collected by Prisk and despatched beyond Matthews. Another change for the Lions followed, Peter Beadle making way for Shay Wiggans. And a few minutes after his first, Prisk got another. A brilliant strike from long range made it 2-0. Brady marked his Lions debut with a goal that Matthews could do nothing about for No3. The visitors were relying on free-kicks by now to give them their chances. None of these came to much before Pagham scored their fourth. as Brady topped a fine game with a second goal, striking well beyond Matthews. Neighbour’s 84th-minute daisycutter sliced its way into the back of the net. At 5-0 up the L:ions were still not finished. Matt Hambleton entered the fray for the Lions, Horncastle going off for a well-earned rest. 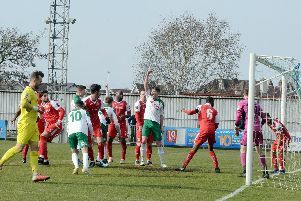 Prisk completed his hat-trick as he struck home to much celebration in the crowd. This was the Lions' sixth haul of six goals or more in a game this season, and it could have been seven late on as a Pagham corner had man of the match Prisk hitting a looping shot toward goal, only for Matthews to get to the ball first. A late challenge on Ryan Davidson by Mutongerina went unpunished before the whistle blew on a morale-boosting win for Lions’ bosses Richie Hellen and Tom Simmonds. Loxwood: Matthews, Courtney, Parker, French, Williams, Swaine, Westlake, Mutongerina, Goldson, Lapite, Bennett; Popham, Goddard, Ringrose.